Free shuttle bus service is available to all terminals. Airport construction has required the closure of several parking lots limiting available parking. Please consider alternate means of transportation when traveling from LaGuardia. Covered and uncovered daily parking for all terminals located closest to Terminals C and D. Free Purple Route shuttle bus service between lot and Terminal B. Parking for all terminals located closest to Terminal D with three hours free in Wait Area. Uncovered daily parking located closest to Terminal A. Free Red Route and Blue Route shuttle bus service between lot and Terminals B, C and D.
Long-term all-valet parking located closest to Terminal A. Please note that parking rates have increased. New parking rates are below. Fly with us. Park with us. LaGuardia Airport offers hourly, daily and long-term parking. A variety of payment methods are available to pay for parking in each lot. All rates are inclusive of taxes and fees. Free Airport Shuttle Bus service is available to all terminals and parking lots. Convenient parking located near Terminal D. The first three hours are free to park in Cell Phone Lot (Lot P5) for passenger pick-up and drop-off. Locate Hourly Parking (Lot P5) and get Driving Directions. 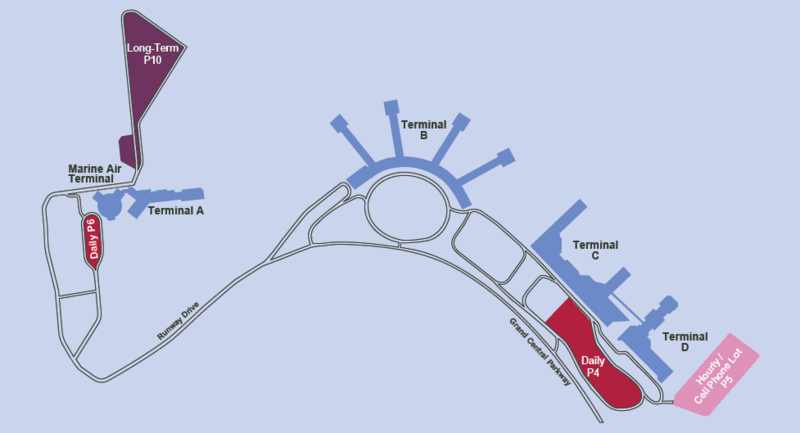 Accessible parking for Terminals B, C and D (Lot P4) and Terminal A (Lot P6). Premium Reserved Parking spaces are available in these lots with a $5 booking fee. Locate Daily Parking (Lot P4 and Lot P6) and get Driving Directions. For travelers with longer stays, all-valet, long-term parking is available in Lot P10, closest to Terminal A. Locate Long-Term Parking (Lot P10) and get Driving Directions. Reserved parking is available in designated spaces in P4 and P6. Guarantee your parking space for $5. Reserve your space today. A number of reserved parking spaces for customers with restricted mobility are available. Designated spaces are located in each parking lot near the terminal entrance. Official disabled license plates or other official permits must be prominently displayed to park in reserved spaces. Rates are the same as Long-Term parking rates.